Purpose: Use this document as a reference for creating billing requests in ctcLink. Enter the Business Unit and select the Bill One ID “Y”Bill by Option. Leave the Billing Request Nbr as is and do NOT enter a value. Billing ID: Select Student Bill. Invoice Date will prefill with the current date; edit if necessary. In the Due Date/Days area enter the due date or days due for all unbilled charges. In the Item Due Info area, enter optional term specific due dates or number of due days. Click the Billing Request 2 tab. Select the XML publisher option in the Output Format field. Aid Term From and To Fields are optional. 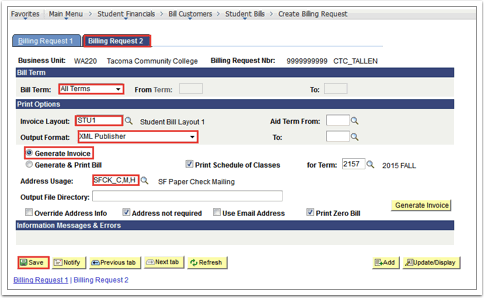 Select the Generate Print Bill option to generate and print an invoice for an individual student. Check the Print Schedule of Classes checkbox to display the student’s schedule on the bill. Enter the For Term to designate the term to print on the invoice for the class schedule. Check the boxes for Override Address Info, Address not required and Print Zero Bill. Click the Generate Invoice button to bypass the Generate Invoice process. This is recommended for single student invoice printing only. Complete the process using the Printing Invoices QRG. Enter the Business Unit and select one of the following Bill by Options. A: Bill All Not Yet Billed - select only those students for whom you have not already generated bills. N: Bill Range - selects all students meeting the criteria defined for the Billing ID that you selected. Follow steps 6 through 11 from the above Creating a Billing Request for one Student section. Select the Generate Invoice option to generate and store the bill. This will not print an invoice. This is recommended when processing a batch of invoices. The system displays the first invoice generated during the process in the Start field on the Billing Request 1 tab and the last invoice generated during the process in the End field. Enter the For Term to designate the class schedule to print on the invoice. Click Save to finish the process. Note the Billing Request number on the Billing Request 1 tab. It will change from 9999999999 to a sequential number you will need for the generate process. Continue with the Generate Billing Requests QRG.